Edition planned to be 50, but far fewer were printed. Signed in pencil and with the artist’s monogram stamp lower center (Lugt 604). 11 3/4 x 9 1/2 in. ; 29.85 x 24.13 cm. 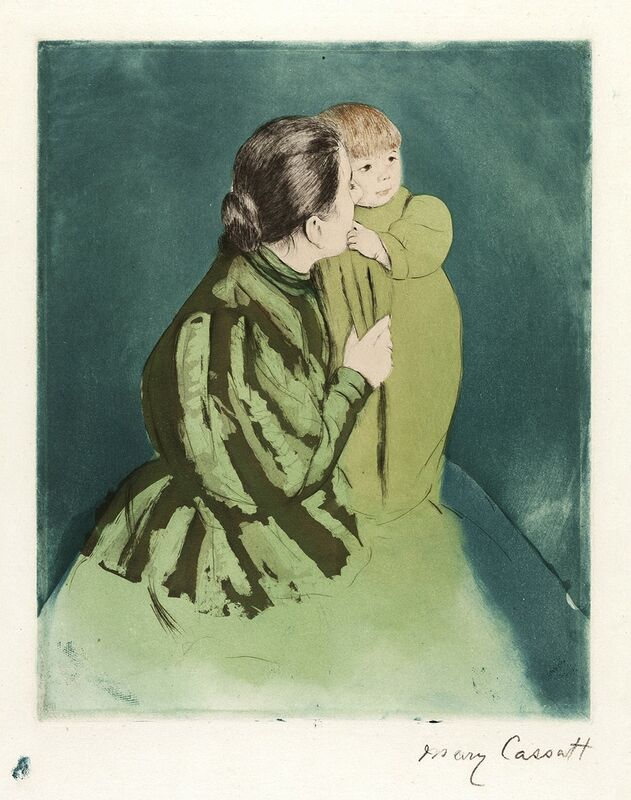 The mother and child was Cassatt’s favorite subject, and she often used the same two models. Cassatt painted a composition similar to Peasant Mother and Child in 1894 and created two related pastels. The print has a painterly inking of the aquatinted surface with a monotype-like plate tone. While three plates were used, each impression from the small edition is unique in coloration and inking. Our print is an early, fresh impression, with a rich greenish-blue background, which provides a striking contrast to the subtle green dress and delicate figures.